All things including homes and offices need repairs as well as major renovations every few years. If ignored continuously, a slightly damaged appliance such as an Air Conditioner, furniture piece or plumbing component is likely to experience more serious damage. Hope or office repairs need to be undertaken on priority but how do you manage it all with a hectic day job, children, pets and dozens of other day to day chores? While you can rely on a local contractor in your neighborhood for some repairs now and then, you almost always need to work with different handyman service providers each time you need some interior handyman services. This is where a well established interior handyman service company in New Jersey such as HAYS can come to your rescue! 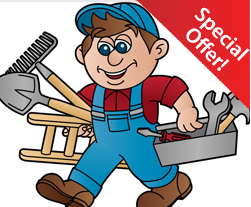 Availing any of the following (and more) interior handyman services is easy. You just need to make a phone call. Given the range of services we provide in New Jersey, it’s pretty obvious that Handyman at Your Service, NJ (HAYS New Jersey) is a well rounded handyman service provider. We have the latest equipments & use technology to the fullest but we know full well that it’s because of our experienced and dedicated craftsmen, technicians and staff members that we have been able to win thousands of customers in New Jersey area. Call HAYS, New Jersey at 732-360-7770, 201-335-7222 for a non-obligatory discussion any day! You can also request a free estimate right away!